Hello my brothers and sisters in Christ! 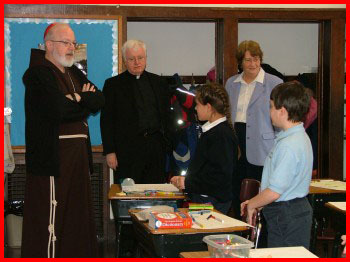 This week I made several visits marking Catholic Schools Week. 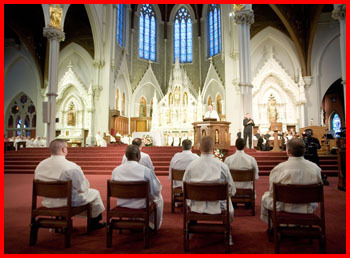 Also this week, I had the privilege of ordaining seven men to the transitional diaconate at the Cathedral of the Holy Cross. 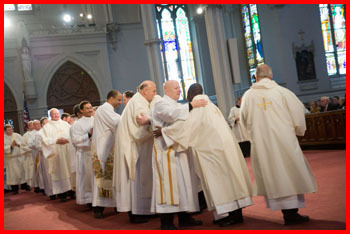 The ordination on Saturday was a great joy, and we were happy to see so many priests, permanent deacons, family members and friends accompany the new deacons at this very important moment in their lives. 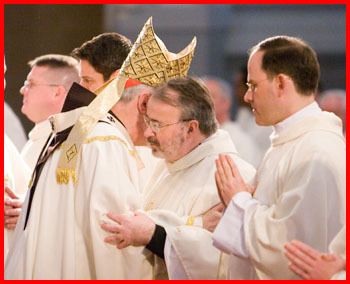 It was an opportunity for all of us to recommit ourselves to working for vocations and praying for vocations. As I look at our seven candidates for orders, I ask are we to say the Magnificent Seven, the Seven Wonders of the World, or the Seven Dwarfs. 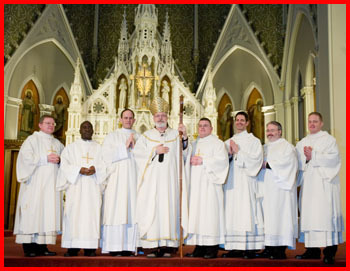 Today they are called as the Deacons in the Acts of the Apostles: simply the Seven. In the New Testament the Apostles are called the Twelve. The Twelve ordained the Seven. 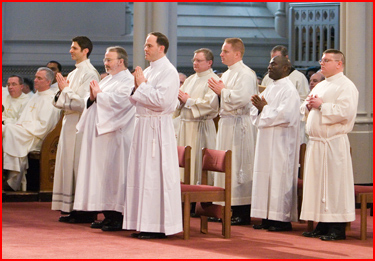 The Apostles ordained the Deacons. 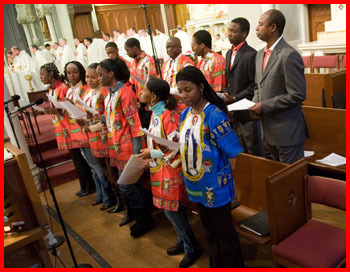 Those expressions, the Twelve and the Seven, imply a solidarity, being a team, being part of group, a fraternity, sharing a ministry and vocation. The Apostles recruited the seven men filled with wisdom and the spirit in order to have more time themselves for prayer and preaching. Those are the privileged activities of the twelve and the seven. As ordained ministers, deacons and soon priests you must jealously guard the hours needed for prayer and preaching. Make that commitment today for the rest of your life. Nothing else that you do should eclipse these two activities. Be men of prayer and then share the fruits of that prayer life with God’s people. Many other things will crowd into your life, never lose sight of the example of the Apostles who delegated some of their responsibility so as to have time for prayer and preaching. 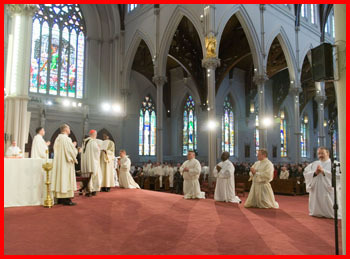 I am sure if we took a survey among Catholics and asked what priorities our newly ordained, indeed all of our ordained, should have, I feel sure that the overwhelming consensus would be that we need our ordained to be men of prayer and men who share their faith life with God’s people � preaching the hard words of the Gospel, in season and out of season, preaching about a God who is not a stranger to them, preaching with words and without words, knowing that a holy life is more eloquent than all the rhetoric in the word. More than teachers our people need witnesses. The Levites are the Old Testament counterparts of the deacons. In the distribution of the Land of Canaan after the conquest, Joshua, acting according to the instructions received by Moses, excluded the tribe of Levi from sharing like the other eleven tribes in the territory. The Levites were given no land because “the Lord the God of Israel is Himself their portion.” That same God is your portion as His Levites, His ordained deacons. The first reading describes the Levites who are “set aside and dedicated to the Lord.” They are put in charge of the furnishings in the meeting tent, the altar and sacred vessels. The meeting tent was the place of God’s presence. For us the meeting tent is the Eucharistic Lord in the Tabernacle. The word “tabernacle” means tent, and the veil on the tabernacle is a reminder of the Old Testament meeting tent where Moses and the Israelites went to be in God’s presence, to pray to Him and to hold up God’s people in prayer. 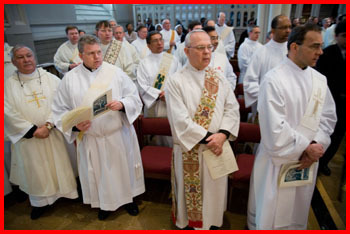 As ordained deacons, and soon to be priests, your life is tied to the Eucharist, the abiding, loving presence of Christ, our divine Master. Make the sacrifice of the Mass the spiritual center of the day, and in daily adoration, visit the meeting tent where Christ awaits. I have always loved the quote from St. John’s Gospel which I saw on an altar in Tegucigalpa: Magister adest et vocat te. “The Master is present and He is calling you.” In the Meeting Tent the Lord beckons you and strengthens your vocation. 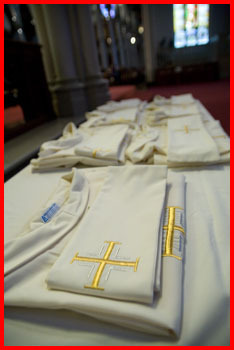 As a Deacon your service is of the word, of the altar and of charity. You do what you do for the love of God and love of God’s people. The Levite in the Story of the Good Samaritan is on the way to the Temple and rushes by the man left half dead on the road to Jericho. 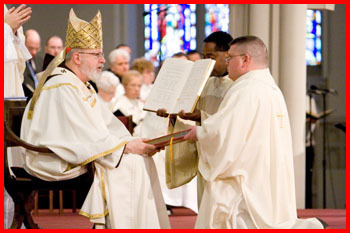 As a Deacon, as one of the seven, you are entrusted with a special mission to serve the widows and orphans, the sick and downtrodden. In doing this ministry of charity, yours is a special role to be a bridge builder helping the various groups to be one with the Lord and one another. 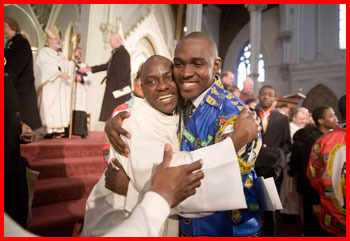 Yours is a ministry of reconciliation and healing whenever there are divisions in the Church. 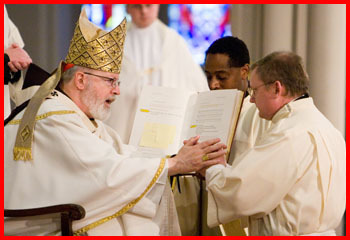 Do not be like the Levite in a hurry who rushed passed the wounded man to put on his liturgical robes. Know that your portion is the Lord, that is where your treasure must be. When the deacon Lawrence was asked to bring the Church’s treasures to the Emperor, the Good deacon took the poor, the sick, the widows, the homeless and presented them as the Church’s treasures. They must be your treasure, God’s little ones. They are the protagonists of the Gospel. 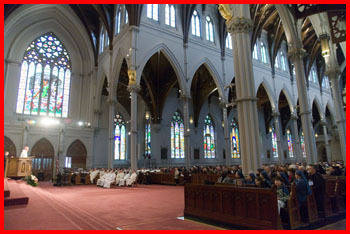 Today’s Gospel contrasts with other vocation stories where the Apostles left their boats, nets, families behind to follow Jesus, or like Levi who left money and tax collections to follow Jesus, or Paul whose vocation story is repeated various times in the New Testament because it betokens such a dramatic change that people could not believe that he had been called. Today’s Gospel on the other hand is a stark reminder that not everyone who receives a vocation ends up following Jesus. We are free to say no. But just as Mary�s �yes� at the Annunciation changed the course of history, every time we say yes to God we are opening the door a little wider for God�s light to shine in our world. When we say no the door closes a little bit and the world is impoverished, left a little darker, a little colder. The rich young man is asking the right question: �What must I do to achieve salvation?� Unfortunately, today not enough people are asking this most important question. Too many are unaware of the true purpose of life. Here is a man who is seeking. He is asking the right question, and he is asking the right person. He was not entirely prepared, however, for the answer or for the invitation that he would receive. Jesus tells him to live the commandments and then mentions the commandments on the second tablet of Moses, the ones that have to do with our relations with our fellow human beings. Jesus displays His affection for the rich man almost as if to give this man the courage he will need. The rich young man averts his eyes from Jesus� loving gaze. He closes himself in, in the fortress of his ego, isolated by his wealth, his face is clouded over and his soul is filled with sadness. He turns his back on Jesus and walks away. The story is a tragedy � an opportunity lost. He turned his back on God and on all the people who could have been the beneficiaries of his ministry. The world became a little darker and a little colder because he said no to his vocation. He disappears into the night. Today the same Master, Jesus Christ, is inviting you: Follow me. Jesus is looking at you with love. He sees your sins and He sees your virtues. He loves you more than you can imagine. In His loving gaze you will find the strength to make the renunciations that ministry requires, the wealth you could have had, the family, the freedom. If you lose sight of the Lord�s loving gaze you will be at risk of turning your back on love. Your treasure must be the pearl of the great price that inspires you to be willing to sacrifice everything to acquire it. For those whom Christ calls any other treasure is fools� gold and will only bring sadness. In today�s world too many are worshiping the golden calf. No wonder Jesus said: �It is easier for a camel to pass through the eye of a needle than for a rich man to enter the kingdom of God.� Chesterton�s droll commentary was that since Jesus said these words scientists have been trying to breed smaller camels and engineers trying to build smaller needles. Your treasure must be Christ and His call to you. All that you do must be for love of the Master who for love of us became a servant. Like Peter you stand before God�s people and say: �We have given up everything and followed Christ.� Your life is no longer your own. And yet Jesus tells us that He has given us a bigger family, a hundred fold, the Family of the Church and the reward of everlasting life. Somewhere in fine print Jesus mentions �persecutions.� We are always the Church of Martyrs, and the blood of the Martyrs is the seed of the Church. Persecution should not surprise us; it is still another way to experience the power of the Cross. There will be moments of trial, temptation and persecution. Never forget that Jesus is looking at you with love. In his loving gaze you will find the strength to be faithful, to be pure, to be obedient, to serve with joy. The rich young man withdrew from Jesus� loving gaze and went away sad. May you remain with our Risen Savior and be filled with His joy. May the Mother of the Divine Shepherd ever protect and bless you. Thank you for saying yes to Christ�s invitation, thank you for saying yes to God�s people. 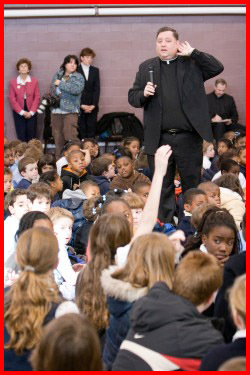 I visited two schools for Catholic Schools Week � St. Agatha in Milton and St. Agnes in Arlington. Both schools are very strong, and they are doing wonderful work. Much of that comes from the dedication of their principals, Maureen Simmons and Sister Patricia Randall, RSM, respectively. 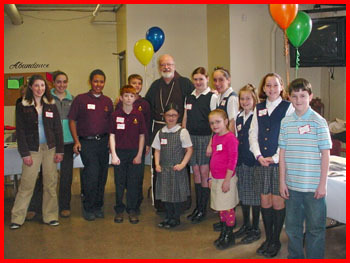 On Sunday, I visited St. Agatha Parish where I celebrated Mass followed by a reception with the children at the school. After the Mass, a young man named Ken McGrath, who is now in high school, gave a witness about what Catholic education meant to him, and he ended with this beautiful prayer. It was very touching. 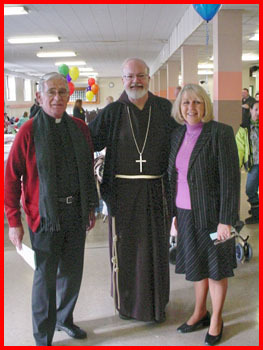 At the reception, which was held at St. Agatha School, they had a number of tables with exhibits on Catholic schools and also on vocations. On Tuesday, I traveled to Arlington where they have 1,200 students in their schools. I celebrated Mass for the grade school children, and then afterwards I visited the high school because the church is not big enough to hold all of the students at once. There are 800 students in their high school, Arlington Catholic High. It was just an incredible experience! 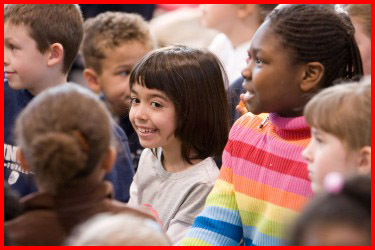 Everyone at the school has done a wonderful job � their Catholic identity is so important to them. 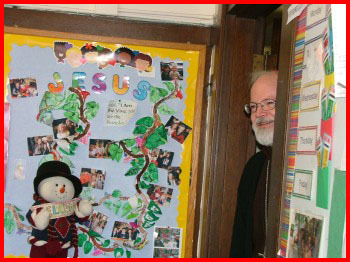 Father Flatley and the other priests there are very much involved in the life of the school. I also visited the parish�s social service center, Fidelity House. 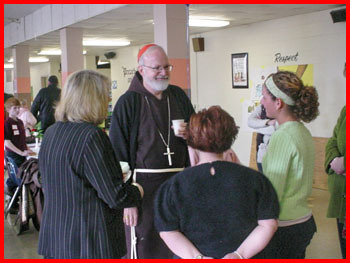 I also spent some time at St. Edward School in Brockton, where we announced the first implementation of the 2010 Initiative, whereby we are trying to strengthen our Catholic schools. 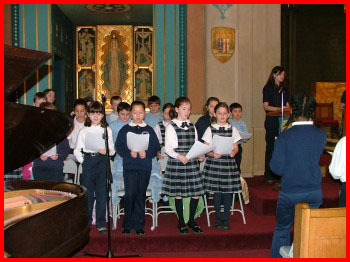 Students from all three Brockton Catholic schools gathered in St. Edward�s auditorium to hear that their schools will become one school on two campuses by the start of the next academic year. 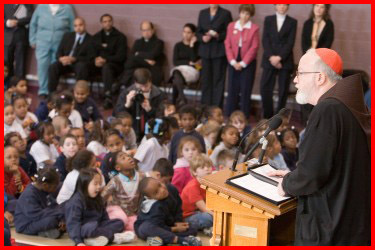 Through the 2010 initiative, we are renewing the Church�s commitment to education. 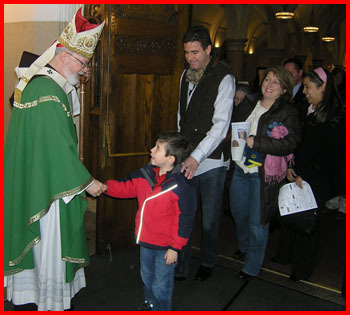 Catholic education is a very important ministry of the Church. 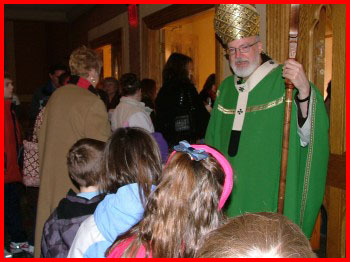 It is not just the concern of those who have school-aged children but of all Catholics. 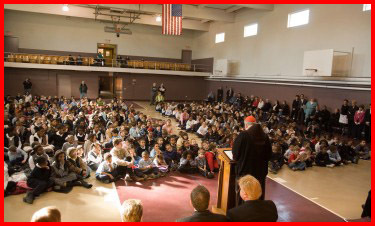 Catholic schools are an important way for us to evangelize, to give a spiritual formation to our young people, to mentor them in the faith as well as prepare them to be good citizens and good members of our society. 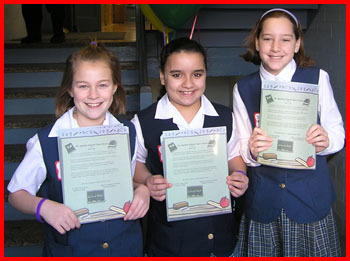 The 2010 Initiative began over a year ago with a study of the entire Catholic school system, done by Meitler Consultants Inc., a leading national consulting organization. 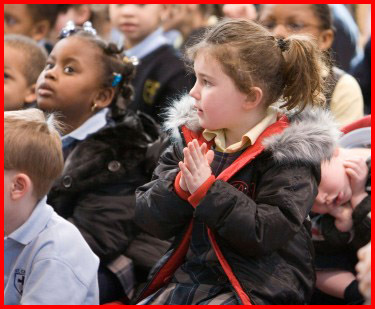 Catholic schools are under a lot of stress. We knew that we needed a very carefully thought-out response for the future to guarantee that Catholic schools would survive. 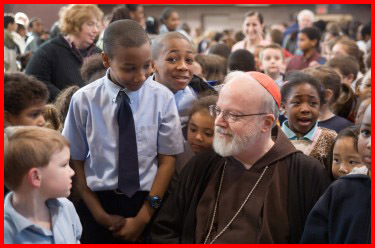 We want our schools to continue to provide a quality education and, at the same time, ensure that the Catholic identity of all of our Catholic institutions will be safeguarded. We have a wonderful strategic committee with Jack Connors as the chairperson. 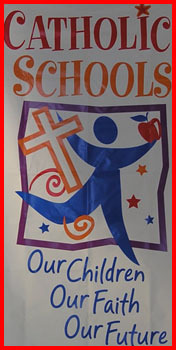 The committee is working very closely with principals and pastors and the Archdiocese�s Catholic Schools Office. They are all trying to be very attentive to the needs of our schools and to make sure that we are able to muster enough resources to strengthen those schools, to promote them and to have the kind of staff development that is required. In Brockton, John Fish, CEO of Suffolk Construction, has been very much a part of the planning. He has generously committed his company to help us with the necessary reconstruction and renovation of buildings. 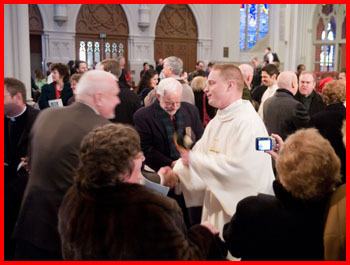 The Catholic colleges are also becoming more involved in Catholic education at the archdiocesan level. Boston College is helping us at St. Columbkille School in Brighton and now Stonehill College is becoming involved in Brockton. 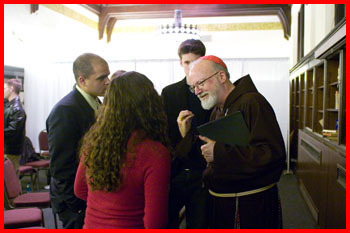 The other Catholic colleges � Merrimack, Emmanuel and Regis � are also helping in different parts of the Archdiocese. 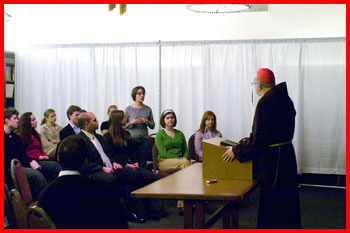 On Tuesday evening, I visited with about 50 students at Boston College as part of the Church in the 21st Century program there. We had a very good conversation. I gave about a 20-minute talk on the Church and what the meaning of the Church is, referring to the Holy Father�s new encyclical. I also spoke about the role of the laity and our vocation. Following my remarks, I took questions for about an hour. The students posed very thoughtful questions, and it was obvious they are taking their faith very seriously. They asked questions about a whole gamut of things: from spirituality to the care of AIDS patients to the challenges posed by secularization to the Latin Mass � quite a variety! One student, who was Greek Orthodox, was very interested in the relationship between our Churches. The other students all seemed to be Catholic, and you could tell that these were students whose faith and the Church are a very important part of their lives. I found it a very encouraging dialogue. This week, the Archdiocese also announced the appointment of a new rector of St. John�s Seminary in Brighton. After consulting with the board of trustees, members of the Presbyteral Council, auxiliary bishops and neighboring bishops, we have made the appointment of Father Arthur Kennedy as the new rector of St. John�s, beginning July 1. Father Kennedy will be in Rome this semester, teaching at the Pontifical University of St. Thomas Aquinas (commonly known as the Angelicum) and working with the Catholic Studies Program there. Father Kennedy brings a wealth of talent and experience to his new role. He has many years of experience in seminary work. 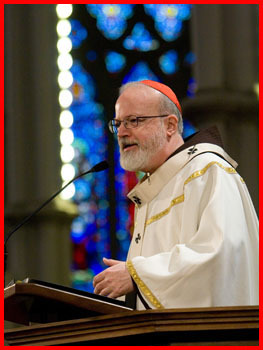 He also worked at the ecumenical office of the U.S. Conference of Catholic Bishops � he is very interested in ecumenism, particularly with the Eastern Orthodox churches. 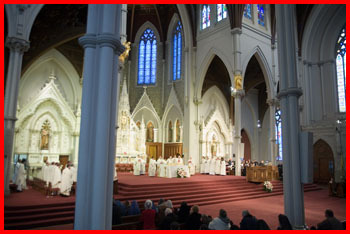 In addition, the fact that he taught at St. John�s Seminary for a time and he is a priest of the Archdiocese I believe will be an advantage for him and enable him to hit the ground running. The seminary community has been aware that Father Farren�s term is ending, and he has been elected to a position in his Dominican province. He will be leaving the position on June 30. 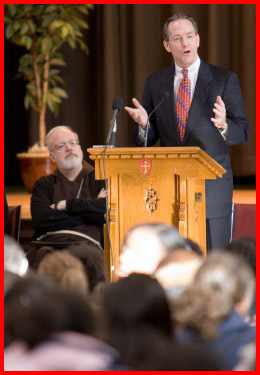 We�re very grateful to Father Farren for coming to St. John�s at a very difficult time in our history. 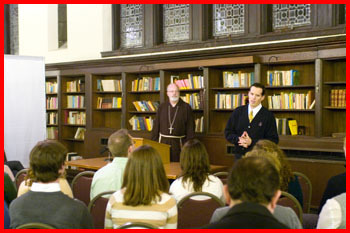 He has worked very hard and the atmosphere in the seminary is most positive. We know the seminarians are truly going to miss him yet we also know that his community will be very happy to have him back, and that he will continue to do great and important things for the Church. Our picture of the week is the logo for the Bicentennial celebration of the Archdiocese. The logo, which was presented to the Archdiocesan Pastoral Council last week, was unveiled on the front page of our diocesan newspaper, The Pilot, which also premiered its own new look this week. The logo is a reminder that the bicentennial is drawing close. We will continue to see more announcements about the activities and the programs that are planned to mark this important anniversary in the life of the archdiocese.